Tea made from thyme is good for many different health problems, it is a very powerful antiseptic. Thyme as a medicine since ancient times was known in traditional medicine. It sooths upset stomach, relieves women problems, soothing jangled nerves and reduces the effects of stress, it is a great cure for alcoholism and lots more. In this article read more useful tips and recipes from this plant. In some parts thyme is called wild basil, field bindweed, scream. It blooms from spring to late summer and is recognized by the pleasant scent, which comes from the essential oils. In medicinal purposes leaves and flowers are used. The plant is harvested from May to August, in good weather, and it should not be grabbed, but cut. Thyme is considered to be a cure for all diseases, because it removes and reduces a whole range of problems. Most often thyme tea is used but essential oils of thyme are also known and are used as a condiment in the kitchen to prepare various meals. Dried thyme contains thymol and carvacrol a powerful antiseptic, and is composed of tannins, bitter substances, flavonoids and essential oils, which consists mainly of cineol. British herbalists recommend preparations of thyme to treat bronchitis, bronchial catarrh and sore throat, especially against strong cough. Thyme is good for inhalation, as it enhances the effects of the official therapy fulfilling two main conditions for coughing out: good hydration of mucous membranes and successful thinning of secretions in the bronchi. Tea made from thyme is especially recommended during the epidemics and the daily consumption of tea successfully stops the spread of many pathogenic germs, while it destroys some. Thyme is a good remedy against intestinal parasites, including the fungus Candida, it is also used against stomach bloating, unpleasant gases, abdominal pain and catarrh of the stomach. Lining of thyme can be applied in cases of stomach cramps. Healing tea stimulates the secretion of urine in the urinary tract when it comes to infections and helps in the case of painful menstruations, augmentations and relieves spasms of uterus. The aroma of thyme calms the autonomic nervous system, so this plant is filled in pillows that are used as a form of therapy for children and adults. Tea made from thyme improves mood and acts against the nervous tension and exhaustion. The children are often given chamomile tea in filter bags and fruit flavoured teas, but you should know that the thyme tea is a much better option. This plant is completely safe and can be consumed without fear, and in doing so it is useful in the treatment of many ailments that afflict children, primarily bronchitis. Tincture of thyme is used for massaging and strengthening of underdeveloped limbs in children and those suffering from multiple sclerosis. Restless or nervous youngsters will quickly fall asleep thanks to the thyme bath. Thyme tea is a known folk remedy against seizures. In addition, oil and tincture of these herbs are used as adjunctive therapy in the case of paralysis, stroke, multiple sclerosis and muscular atrophy. Every pregnant woman is asked at least once during their pregnancy which teas should she drink and which not. For this dilemma you must consult your gynaecologist, a physician but always listen to the advice in pharmacies that pharmacists give, often they are much better versed in this subject and you will give the right answer. 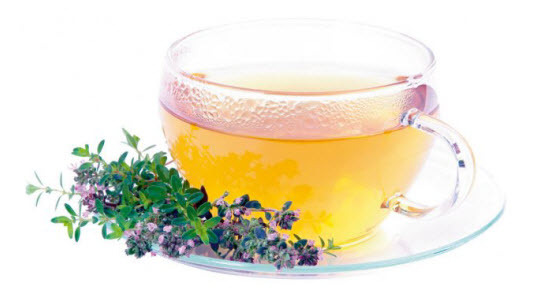 Generally ​​thyme tea should not be drunk while you are pregnant, even during breast feeding. There are other opinions that are still allowed, but in small quantities, but it is necessary to consult with professionals. Our recommendation is to drink a mild mint tea - mint as an alternative because it will exert positive effects on your body as a whole and most importantly it is completely safe and you do not need to worry about anything. The recipe for the tea is very simple and all it takes is that two teaspoons of thyme are poured with 2 dl of boiling water, covered and after 10 to 15 minutes filtered well. Thyme tea can be sweetened with honey but in the case of stomach problems as gastritis or stomach ulcers it is not recommended, no additives but it is drunk alone. Drink three to four cups a day. It has a fine, mild and neutral taste and will appeal to your children, even when at the same time we know that it is a great prevention for respiratory diseases. If you put flowers of thyme in pillows and sew the hole well, you can get excellent therapeutic pad, that can provide you with a comfortable and restful sleep, and you will be rid of daily tensions and stress. Tea and pads are an excellent combination and be sure to try it out. In one litre of cold water put 20 g of rosemary, sage and thyme. The mixture is left for three hours and is then warmed to 80 degrees Celsius, filter it through a clean cheesecloth and pour into a bottle and seal well. This hair lotion is used once a day to massage the hair roots. The combination of these three plants destroys microbes that attack the scalp and cause dandruff. Learn more, see What is seborrhoea. Thyme is a known folk remedy against alcoholism. Addicts who regularly drink thyme tea have nausea, vomiting, severe diarrhoea and frequent urination, excessive sweating, increased appetite and thirst, and in the end a person loses the desire for alcohol. A handful of thyme is poured in a litre of boiling water, cover it and let it stand for two minutes. Pour the tea into a thermos bottle, from which the addict takes one spoonful every quarter of an hour.